(Nanowerk News) Light readily bounces off obstacles in its path. Some of these reflections are captured by our eyes, thus participating in the visual perception of the objects around us. In contrast to this usual behavior of light, MIT researchers have implemented for the first time a one-way structure in which microwave light flows losslessly around obstacles or defects. This concept, when used in lightwave circuits, might one day reduce their internal connections to simple one-way conduits with much improved capacity and efficiency. The laws of nature that govern the world around us allow for the propagation of light in both directions. If a light beam is observed propagating in a particular direction, one can also shine a light beam to propagate in the opposite (backward) direction. "The very fact that reflected beams are allowed to exist, combined with the fact that light at least partially reflects from most objects it encounters, makes optical reflections ubiquitous in nature," said MIT physics Professor Marin Soljacic, the senior author of the study. 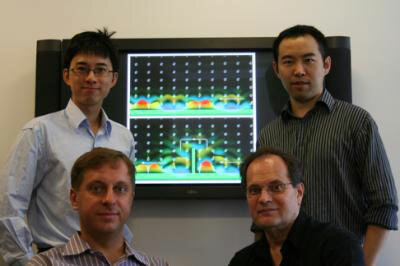 In a dramatic departure from this common phenomenon, a team made up of MIT physicists Dr. Zheng Wang, Dr. Yidong Chong, Prof. John Joannopoulos, and Prof. Marin Soljacic have implemented and experimentally tested so-called topological photonic crystals that completely prohibit the existence of any lightwave back-reflections. The results, published in the 8th October 2009 edition of Nature, show the first experimental observation of the fascinating new phenomena and capabilities associated with microwave light propagating in this uniquely designed waveguide (a tunnel or "road" for guiding light). Through the application of an external magnetic field, this specially designed waveguide induces unusual restrictions to the propagation of the light inside it. "We have now found a way to make light travel without bouncing back, by shining it through an array of small ceramic rods placed in a strong magnetic field," said Dr Zheng Wang, a lead author of the paper. For example, instead of light being able to travel to the right or to the left along this waveguide (as is traditionally expected), a magnetic field pointing upwards will allow light propagation only to the right, while a magnetic field pointing downwards allows for propagation of the light only to the left. "Once a particular forward direction of the light travel is chosen, no backward travel is permitted," said Dr. Yidong Chong, also a lead author of the paper. Therefore, light can never bounce back or reflect. Rather, it effortlessly routes around any obstacles and defects in its path without incurring any dissipation. "Loosely speaking the waveguide acts as a perfect cloak of the defect or obstacle in the path of the light" said Professor Joannopoulos, "the only difference is a phase shift of the guided light." While the focus of the present work is in the microwave regime, in conventional optics, light reflections present a major roadblock to light-driven circuits reaching the same level of sophistication as widely used microelectronic circuits. A variety of practical applications, such as optical isolation and optical information storage, could potentially benefit from the novel and unparalleled one-way photonic behavior observed by the MIT team. Numerous applications that require strong interactions between light and matter could also gain from such an efficiency boost.